Although Romania has been in the European Union since 2007, and full members of it since 2012, there are many things that are still way behind many of the other 27 countries. Part of the problem is corruption, but historically, poverty – under Communism and Ceaucescu – was so destructive. I’ve been going to Romania since just after it gained independence from its Communist, and much worse, Ceaucescu heritage – their revolution began on December 16, 1989, and ended with the ‘execution’ of Nicolae and Elena on Christmas Day that year. I was there with a team from the church I was then part of, with 6 trucks full of aid, on 4 February 1990. The poverty to us was simply unreal for a European country, only 1400 miles away from us in the UK. One of the problems for families was that they had very sick children because they couldn’t afford to take their kids to the doctor or the dentist. I couldn’t even begin to tell you the number of really sick kids (NOT orphanage kids – normal family kids) I knew, and, in many cases, still know. Everything medical is so expensive, even worse since their advent into the EU, as what had been priced in their currency (the Leu, or Lei) was recalculated to euro prices, even though they kept the lei (more to do with the EU than a Romanian decision, I think). Some of you will remember a young lady in Romania, Ionela: she’s had the most unbelievable couple of years with extremely serious sickness – she was only 24 years old in November (I’ve known the family since 1991 in my early days in Romania, so I knew them before Ionela was born in 1993). Not only has she had constant illness, (she knows what’s going on, as she’s a genius, and is a trainee doctor, in her 5th year, but has had to give up because she’s been so ill, though I pray she’ll be able to go back to do her last year), but last autumn, her dad died with liver failure, and last Tuesday, her mum dropped dead having only shown signs of illness on Monday). Tragically, Ionela was unable to pay for the funeral (they’re ridiculously expensive, too, a real opportunity for the Orthodox Priests to line their pockets. So mum just – literally – was put in the fire at the hospital. Ionela couldn’t even afford to get to see her, as she lives (through study) in Bucharest, and her family home is in Moldova, 500 kms (each way) from Bucharest. Both parents were in their early 50’s when they died. In less than 2 years, Ionela’s had breast cancer (a large tumour removed by a genius doctor and healed scar-less, I’m told(!) by God: peritonitis from a burst appendix; another brush with peritonitis when she had a gastric ulcer about to burst; massive ovarian cysts which resulted in a hysterectomy, followed by removal of the ovaries, fallopian tubes – in fact, the full reproductive system; thyroid problems (still being dealt with with when I have enough money to help her with hospital costs): and now, chronic kidney issues with excruciating kidney stones. She’s bleeding profusely with every urination, spends a lot of her day in tears with the pain of the stones, even more with the pain of urination. The doctor has told her it’s severely damaging her kidney. She needs surgery – BUT – the procedure to remove the stones is 2,500 euros, about 10 times what Ionela earns in a year. She’s talking to me about selling her good kidney to pay for it, they would remove it in the same surgical procedure, which of course will put up the price of the surgery! Rock and a hard place? I think so. I’ve talked her away from selling her organs and told her that I’ll find the money somehow, somewhere. I’m limping and staggering around my house looking for things I can sell online to raise the 2,500 euros as quickly as possible (just over £2200). To give you an idea, the hysterectomy was about 15,000 euros (£13,300). She is trying to get some money owed to her – it was stolen from the hospital when she had to unexpectedly stay overnight for a general anaesthetic – suing the hospital as it was a staff member who stole it (thank you CCTV!!) – but twice now, she’s been to court, and discovered that the hospital director, her lawyer, AND the judge, have been working in cahoots, and they are ripping her off, the court case keeps getting put forward. It should have all been done and dusted on February 22: then this morning: now it’s May 24. She will win, but she’s fighting the corrupt legal system. A couple of hours ago, she had no money and no food: fortunately, I had a little in my account and was able to send her 100 euros to buy some food, and pay her heating and water bills. In the same period of time that she’s had this ‘medical encyclopaedia’ of illness, she’s really growing as a Christian: it’s so good to talk to her on WhatsApp, or Skype, and pray with her. It’s so good to see her writing about prayer, asking Jesus for this or that, the enemy is doing all in his power to destroy this fledgeling Christian. He isn’t going to win!! I spoke to Ionela an hour ago, she was in tears with pain (she can’t afford pain medication strong enough to touch the pain of the kidney stones): she desperately needs this surgery, and I’m just not in any financial position to help her. Can you? If you can, on her behalf, I’d be so grateful: needless to say, she’d be over the moon to be able to get into the hospital this week to remove the pain. The problem with the medical system there is this: you have to pay UP-FRONT for any treatment, so she can’t have the surgery and then pay for it: she has to pay for it first. If you can help, you can send to Stewardship if you’re a British tax-payer – www.stewardship.org.uk – my account with them is Paul Bennison Healing Ministries Worldwide, number 20028331. If you don’t pay tax, you can send it to my bank – let me know and I’ll send you the details (having had my bank account hacked a couple of months ago, I’ve no intention of putting the details here!). There is also PayPal – all you need for that is my email address, (paul@paulbennison.com). Whatever I get for her, I can send it through my bank to hers, using the amazing ‘faster payment’ service, which can mean it’s in her account in a few minutes. If you can help, can you let me know, please? And it would be helpful if you could let me know how much! As it rises, so will Ionela’s spirit! I’ll be so grateful to you for her: she has no other family apart from a sister who’d ‘relieve’ Ionela of any money she had for surgery (nice, huh?) and an uncle who is just aggressive and unhelpful. I feel a bit like a dad to her right now! 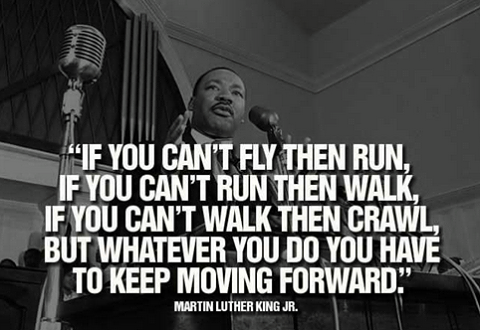 The third line of MLK’s quote is very applicable to me right now! The cracking of the bones is fascinating (! ), but what’s not so good is that they feel like someone’s heated a knife up to white-hot, and then driven it into the joints. Last Friday, I had the very ‘interesting’ steroid injections into my knees – in the hope they might ease the pain (normally their effect is 6 weeks to 2/3 months) – last week, the effect was less than 12 hours! I’m writing to the local NHS Trust to complain, and seek compensation, as I’ve hardly left my house in 7 weeks, and some days, even walking the 20 feet to my kitchen is impossible! I’d really value your prayers for wisdom: I still believe it’s in God’s plan for their healing, but I’m wondering if that plan includes surgery…. it’s a 2-year waiting list, which is really no good to me, or alternatively, I could go to France where the wait is less, or Colombia, where they could be operated on next week, but it’d cost about US$10,000 and they’d have both done, and me walking normally in less than 3 months. ‘False signs and wonders always draw the attention to a person and glorify a man. True miracles always draw our attention to God and they’re done in the name of Jesus.’ Yes, Bil Johnson!! It’s one of the many reasons why I desperately try and avoid becoming well-known – there are too many ‘famous’ healing ministries in the last few decades – and why I’ve fought to stay ‘under the radar’ for the last 39 years. Bill Johnson says ‘Jesus did not give you the Holy Spirit so that you could do nothing. He has called us into an army whose assignment it is to invade the impossible’ ….. ‘I want to see how much of Jesus can truly possess my soul before I die. That’s my ambition’. Wow…. Yes, Lord…. That’s so much better than promoting me – I’m no one…..